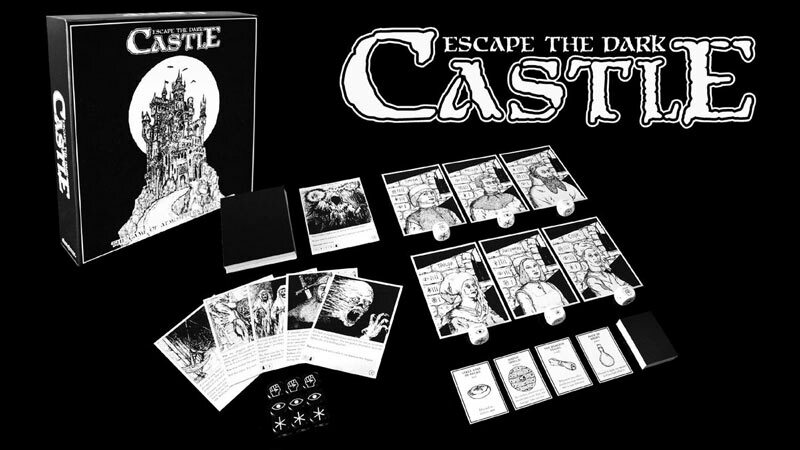 Contrary to what the title may suggest, Escape the Dark Castle is NOT the latest card based escape room styled game. Imagine taking the best part of Eldritch Horror (the encounter cards) and making an entire game out of them. 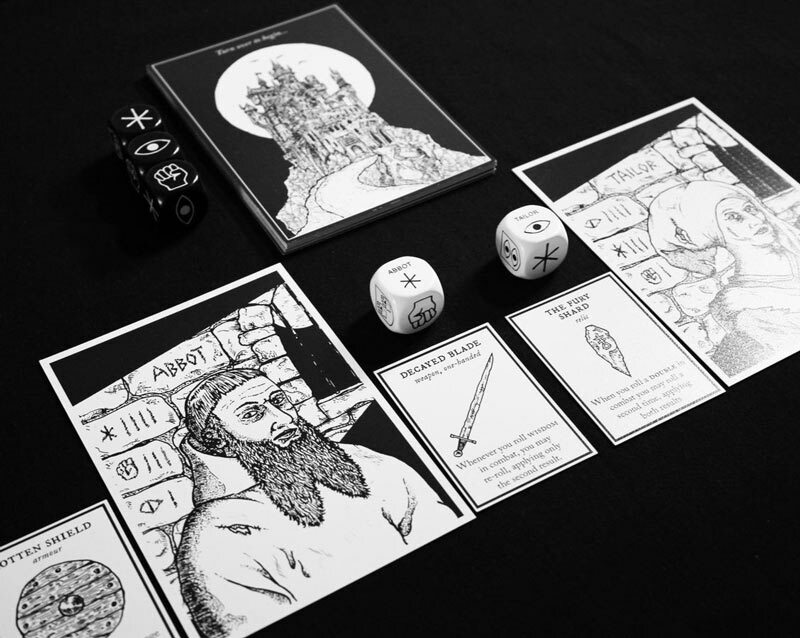 Add in an item deck, some nifty custom dice, and obscenely large cards that you’ll never find sleeves for and you have a pretty good idea of what to expect from this first title from Themeborne, an indy publisher out of England. When I first stumbled upon Escape’s kickstarter page last year, it sent up plenty of red flags. 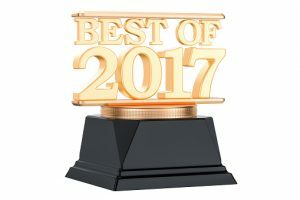 First time publisher & designers. Stark retro style ink line art. Simplified implementation of the beloved Fighting Fantasy books. Ambitious custom components. Absurd card sizes. I never should have backed this project. Something though about the art and emphasis on story hooked me. So lets see if the game is any good! Escape’s mechanical bones are dead simple. You make your way through 15 random chapter cards and then face off against one of 5 or 6 random bosses. Along the way you’ll gather random items, roll the dice for skill checks, and fight nifty little dice driven battles. Rounds have a free form turn structure where the players decide as a group who is going to “take point” and flip the next chapter card. Each giant chapter card is slightly larger then the page of a paperback book and you get a real feeling that the random 15 card deck is trying to simulate the feeling of flipping through a Fighting Fantasy or Choose Your Own Adventure game book. Some pages will simply initiate a fight. Other pages will give you a non-combat encounter, and yet others will offer players a mix of choices and skill checks. Most skill checks and rounds of combat involve simultaneous dice throws from the players, so there is virtually no down time at any point in the game. Players are always involved in the action or listening to the story. The simplicity of Escape’s rules allow it to be extremely easy to teach. Players need only pick a character and follow the instructions on the cards. Aside from that there are virtually no other rules aside from a few rules about inventory management, combat rewards, and resting. 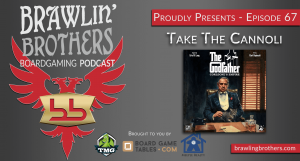 The design team has done everything possible to reduce the rules overhead and allow the game to be as approachable as possible. This brings us to perhaps the most glaring problem with Escape. One player’s simplicity is another player’s lack of decision space. Escape sacrifices complexity for ease of entry. Escape is clearly being aimed at a younger audience and/or one that lacks experience with more complex games. Fans of more complex games like Eldritch Horror may be disappointed by what they perceive as a lack of interesting player choices and agency. The main choices you can make in the game involve which character “takes point”, if/when you will rest in combat, and whether or not you want to press your luck on certain tests. This means that Escape really does boil down mechanically to a game that mixes rudimentary push your luck dice elements with simple card based story passages and decision trees. A lack of decision space would normally be the final nail in the game box for me, but luckily for Escape, it wisely keeps the game at a brisk filler length of 30 minutes or less. Any more time would make for a frustrating experience, but Escape manages to confine itself to what feels like a perfect length, and with its butter smooth rules there is almost no chance of it running long. Also, the only thing that makes your character special is result spread on their custom dice. There are no special player powers (HUGE MISSED OPPORTUNITY). It would have been very easy to give players special abilities that would be triggered anytime they rolled their dice and had it come up with the side that included their character’s name (a 1 in 6 chance). Despite being somewhat on rails, Escape the Dark Castle, does manage to do an outstanding job at what it is trying to do. Both of my 11 year olds have had a lot of fun experiencing the random stories that unfold. My daughter enjoys how the game moves briskly and keeps all of the players involved in the game. My son appreciates that the skill checks and combat are lightning quick and uncomplicated. Both of them have enjoyed the narrative flair and art found on each chapter card. As a filler game, Escape wants to tell you a fun little story without taxing your brain in a short period of time and it succeeds at doing just that. No review of Escape would be complete without at least some mention of components. The entire product feels deluxified. Chapter cards are HUGE, and dwarf even tarot cards. 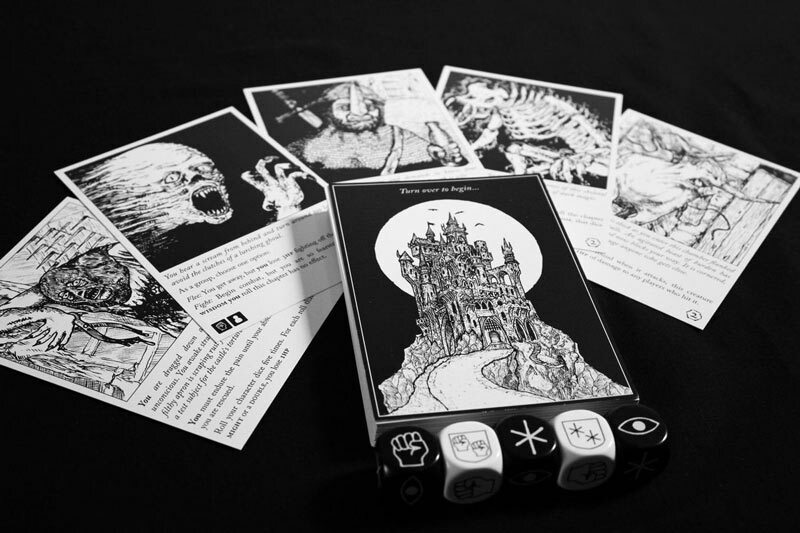 The size allows each card to show off the line art in all its glory while keeping the text size roughly on par with what you would expect from a Choose Your Own Adventure book. The result of course is that each card looks and feels like a page out of a book. The item cards seem to be a smaller Euro size, but oddly, the dimensions won’t work with any sleeve I’ve been able to find. The quality of all the cards seems to be top notch although the size of the chapter cards is so obscenely large that you won’t be able to shuffle them effectively. I’ve found that sorting them into piles and randomizing card draws with a d10 are the best hope of “shuffling” these cards. The lack of sleeves may be a problem for some players because the backs of the cards have solid black borders (the chapter cards are all black, which is weird) and are going to show wear very soon, even with gentle use. The game also comes with 16 large “etched” chunky custom dice in the base set, and another 4 in the expansion. Most of the time you are only rolling 1 dice at a time so it helps that these dice feel good to roll. The custom symbols are all easy to read and can be understood even if you are on the other side of the room. 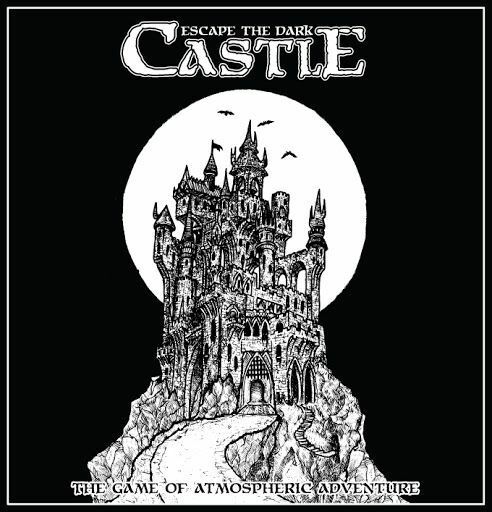 Escape From the Dark Castle is a great resume building first effort from Themeborne. They have created a solid and highly enjoyable product with top notch production values. I will certainly be keeping a close eye out for their future endeavors. Escape manages to call back to the adventure books of yore with all the zeal of the best “Eye of the Beholder” fan fiction out there. While I cannot recommend Escape to EVERYONE, if you are looking for an ameritrash storytelling adventure game that can be played in 30 minutes or less, I can’t think of any game that will scratch that particular itch any better then Escape From the Dark Castle. For families of casual gamers or who have children that enjoy stories with a Gothic polish, buy with confidence!